Caring for your commercial property is as important for business growth as is formulating industry policies and strategies. We hire experts to formulate our commercial strategies, and similarly, it is also advisable to appoint specialized and experienced repair and maintenance commercial handyman services in NJ for keeping our commercial premises cleaner and better maintained. 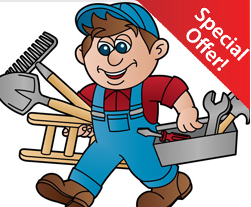 For prompt handyman service in and around New Jersey Area, call 212-222-2770. You can ask for same day inspection, or schedule to your convenience. Repair and maintenance of a commercial property is always a big project, and so appointing experienced handyman services the correct decision. You can contact HAYS-NJ for versatile and affordable commercial handyman services in NJ any time of the day or night; we are available 24 hours a day x 7 days a week. Apart from what’s mentioned above, we can look after a plethora of commercial property problems. The make of each building and commercial complex varies from one another, and we provide customized handyman solutions for each for long lasting results. Our service center can provide you other useful information, provide free estimates and give customized project budgets and plans. Call 201-335-7222 and make same day appointment or schedule at your convenience.